In "phrasebook" mode, some phrases will have highlighted words in red. This means it is a part of a vocab list. What is a Vocab List? A "vocab list" is a list of options which you can use to make the sentence apply to you. By tapping on the vocab list item (in this case, "China"), a list of possible alternative words and phrases will be provided. Choose which one applies to you best. By doing this, you can change the phrase. 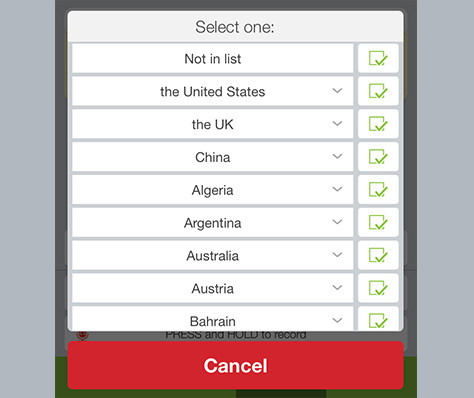 For example, let's select "the United States". Tap on the "+" sign beside it to display a translation on how "the United States" is said in the language you want to record. Tapping the play button will play the vocal guide audio. How the phrase or word is pronounced. How the phrase or word is written. Playback vocal guide audio of the word or phrase. Tap on the checkmark to use it. Great! Now you can record your new phrase.